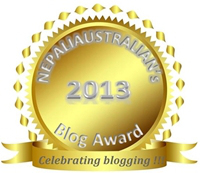 I interrupt the stories of our adventures to share with you Nepaliaustralian’s blog and her annual blog awards. Yes, she really is exactly what the title says – an Australian from Nepal, in the same way I’m a Canadian from Australia. Her blog is interesting and eclectic with an emphasis, naturally, on Nepali culture. One day we will visit Nepal. It’s on our list. We’ve been nominated for Best Travel Blog of 2013! What an honour. Thank you to Nepaliaustralian and those who nominated us. Go check out her blog, go check out all the other fabulous blogs that have been nominated, go vote for us here. Congratulations on your well deserved recognition Alison! Thanks Silk. It was such a surprise. Congratulations! I’m so sorry I can only vote once! Thank you so much Sreejith. Thanks Paulette. Very fun! I’m impressed with how much trouble she’s gone to to create these awards. I know, there are so many listed there. That was very sweet of her. We’ve a great cyber community. Hope you win! Thanks Kozo. It’s an honour. I tried to vote for you, but the links just seem to send me around in circles. Maybe it worked, but no confirmation of the vote. Have you had any similar feedback? Anyway, hope you win! Your comment will say ‘Awaiting moderation’. I think she’s keeping all the votes unpublished until the end. Congrats to you both. So well deserved! Please keep up your wonderful blog, I feel as if I am on the journey with you! Thank you so much Helga. I so glad to hear you’re enjoying it. Saying you feel as if you’re on the journey with us is the best compliment! I’m not a fiction writer, (I don’t know anyone does that!) so I’m enjoying the 5writers journey too.